Though the announcement of the Aadhar Card was done before the establishment of the BJP government in the nation, the credit of implementing the scheme on a massive scale must be given to the Modi sarkar. The official launch of the scheme was done on the 28th of January, 2009. The Ministry of Electronics and Information Technology will look after the successful operation scheme. The Aadhar Card is a special identification documents that is issued by the central government of the nation. The Aadhar pass is given to every individual who is a legal resident of the country. The pass has a chip that contains all personal details of the particular person. To give the data an authentic base, the government will also collect the biometric data of the person. Once all personal, demographic and biometric data is compiled, the central government will issue a code that consists of 12 digits. Every person over the 5 years of age can apply for their Unique Identification Code. Unique Identification Authority of India maintains a web page that has all details of the card and the scheme. Just click on the link https://uidai.gov.in/ and get your doubts clear. Apart from detailed information about the scheme and the unique code, one can also apply for acquiring the Aadhar Card from this site. 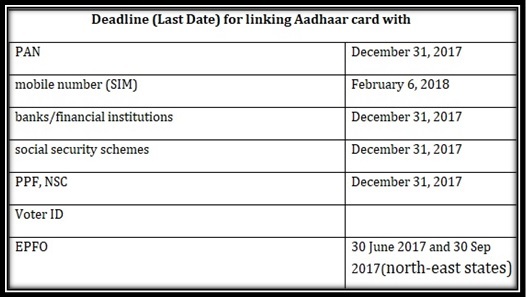 After one has applied for the Aadhar card, the status of the application can also be checked via the official web page. As the central government understood that the implementation of the Aadhar card has been a success, it started announcing several schemes and mandates. As per these rules, the code has become mandatory for any legal work. The government aims at replacing all documents with this one pass and the unique code. The first of such long list of rules was seeding the code with the bank account. It gave the central government access to the financial records and transactions of all people. It allowed the authority to curb menace of black money. Soon enough, the UID code was made mandatory for PAN, ration card, voter card and so on. Now, a person will have to produce the unique code for getting new mobile phone SIM card or booking any travel tickets by airplane or train. Now the code is required for tax payment and tax refund applications, central or state welfare schemes and many other things. Participation in the central sponsored Digital India movement also requires the presence of the code. The Aadhar Code is needed to apply for, open and access the documents kept in the DigiLocker. Soon, a time will come when the Aadhar pass will replace all documents for identification verification. Why is it good for security purpose? Booking air travel and railways booking will also require the 12 digit code from now on. Seeding the Aadhar card with bank accounts or Digital Lockers will allow the individual with extra security. As these are secured by the code, that records the biometric details of the person, it is almost impossible for any other person or agency to replicate the same biometrics or the Unique Identification Code.